Source: Spiewak R. Systemic photoallergy to terbinafine. Allergy 2010; 75 (8): 1071-1072. Terbinafine is an allylamine antymycotic drug with a relatively good safety profile. Minor skin rashes have been observed in 2% of treated patients (1). Photosensitivity due to terbinafine seems very rare: Until now, only isolated cases of terbinafine-induced lupus erythematosus (LE), subacute cutaneous LE or terbinafine-exacerbated LE have been reported (2-4). To the author's knowledge, this is the first description of photoallergic dermatitis to this drug. Key words: adverse drug reactions, photoallergy, photoallergic dermatitis, photopatch testing, terbinafine. A 60 y.o. male was prescribed oral terbinafine (TerbiGen™, Merck Generics) for his onychomycosis. The treatment started in a sunny September, with the patient spending daily 1-3 hours outdoors. On day 6 of the therapy, an itching skin rash emerged on his forehead and dorsi of hands and gradually aggravated. Suspecting a connection with the newly-started antimycotic, the patient discontinued TerbiGen™ on day 8. However, erythema, oedema and scaling continued to progress on his face, décolleté and dorsal neck, accompanied by moderate malaise and slightly elevated body temperature. Covered areas of the skin were not involved. On day 12, the patient sought medical help after orbital swelling appeared in the preceding night. Local and oral steroids led to a significant improvement overnight, and complete clearance within 2 days. 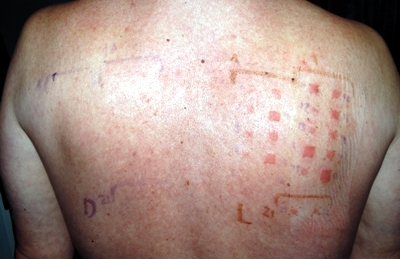 Suspecting a photoallergic reaction, photopatch tests were carried out two months later with an extensive series of photohaptens (cosmetics, sunscreens, drugs, etc. ), including patient's own drugs taken during the episode: terbinafine, thiamazole, perindopril and bisoprolol (tablets crushed and mixed with 0.5 ml saline 0.9%), following standard methodology (5). The only positive reaction was to TerbiGen™, scored as ICDRG "+" after 72 hours of application to the skin (24 h after irradiation of the site with 5 J/cm2 UVA) and "++" after 96 hours (48 h after irradiation). Crushed tablet seemed useful for initial testing, however, the results needed to be confirmed with pure substance. Thus, a second round of photopatch tests was undertaken with a dilution series of pure terbinafine hydrochloride (Sigma Aldrich) dissolved in liquid paraffin, ethanol and water at 1, 2, 5, 10 and 25% - all with "+" to "++" reactions. All tests remained negative on the non-irradiated side (Fig. 1). To exclude false-positive (phototoxic) reactions, the author underwent the same tests - all with negative results. Later on, 5 other patients with suspected photoallergy tested negative with terbinafine at 1% and 5%. Paraffin proved better vehicle for the hydrophobic terbinafine, than ethanol or water. Based on the present case, photopatch testing with 1% and 5% terbinafine hydrochloride in paraffin seems most advisable until collecting more experience. Fig. 1. Photopatch testing with a dilution series (1 - 25%) of terbinafine hydrochloride, dissolved in liquid paraffin, water, and ethanol, 96 hours after application of the tests and 48 h after irradiation with 5 J/cm2 UVA. On the left-hand side (non-irradiated), no reaction to the same test substances. The fact that the symptoms continued to aggravate after cessation of the exposure, along with negative test results in 6 controls, suggested a photoallergic, rather than phototoxic reaction. However, the relatively short period between starting terbinafine therapy and developing symptoms seemed somewhat confusing, as contact allergy requires an induction phase to develop and does not appear upon first encounter with the offending photohapten. Moreover, the induction of contact allergy seems to require exposure to the hapten via the skin in order to "condition" effector lymphocytes to migrate to the skin as target organ (6), which seems also true for photoallergy. After repeated inquiries, the patient remembered that several years prior to the present episode, he was prescribed Lamisilatt™ cream (terbinafine hydrochloride 1%) for some rash on his hands. He could recall that he had used the cream for 1-2 weeks and this was in the summer. It seems that this combination of a pre-existing inflammatory skin condition (disrupted skin barrier, danger signals) with exposure to terbinafine and solar irradiation might have created circumstances (formation of photoadducts) leading to the induction of his photoallergy. Roberts DT. Oral terbinafine (Lamisil) in the treatment of fungal infections of the skin and nails. Dermatology 1997; 194 Suppl 1: 37-9. Murphy M, Barnes L. Terbinafine-induced lupus erythematosus. Br J Dermatol 1998; 138: 708-9. Brooke R, Coulson IH, al-Dawoud A. Terbinafine-induced subacute cutaneous lupus erythematosus. Br J Dermatol 1998; 139: 1132-3. Holmes S, Kemmett D. Exacerbation of systemic lupus erythematosus induced by terbinafine. Br J Dermatol 1998; 139: 1133. Spiewak R. Patch testing for contact allergy and allergic contact dermatitis. Open Allergy J 2008; 1: 42-51. Vocanson M, Hennino A, Rozieres A, Poyet G, Nicolas JF. Effector and regulatory mechanisms in allergic contact dermatitis. Allergy 2009; 64: 1699-1714. Document created: 28 November 2009, last updated: 4 July 2010.